I need suggestions for Rulesets (not important the historical period) suitable for a 2'x 2' Tabletop (60cm x 60cm). What scale are you gaming in? Well, I'm thinking to use 10 mm miniatures. The Portable Wargame (shameless plug by me … but they were designed for a restricted size of tabletop). Neil Thomas's one hour wargames. Or many of the" 5 core" rules from Nordic weasel. And of course DBA? I just got Neil Thomas' 19th Century rules and they have a scenario that's a mini game meant to be played on a 2x2 space. I see it as much as a jumping off point as anything else. The rules there are quite specific to the period whereas One Hour Wargames is far more general. I would also recommend the Portable Wargame. As noted, ancients/medievals with any of the DBA clones on a 40mm frontage. WWII/Moderns will work at 1"=100 yds, though 1"=150 yds will work better. Anyway, about stand=platoon. and rifle platoons need to be on a 20mm-1" base. So FOW is out, but CD or something similar will work. Horse & musket is fun. Your units can't exceed 4" frontages deployed, and 3" would be better. 1"=25-50 yds and you can fight with Napoleonic or AWI brigades, each unit being a battalion. By ACW, your units need to be brigades or the artillery will prevent maneuver. OHW at 2/3 scale will work if you can stand the lack of formations. For ACW, I'd say ADF, F&F and OTR will work with some adjustment to the scales. For AWI or Napoleonics, either work with a roster system, or find one which removes losses by bases. You probably don't want to mark off individual losses in 10mm, and you certainly don't want to base them individually. Another vote for The Portable Wargame. These too would meet that requirement Neil Thomas's one hour wargames, 5 core Company Comand from Nordic weasel. My portable table is a cork board that measures about 23" x 34" marked in 2.5" squares. DBA obviously, but Basic Impetus, Sword and Spear are also possible on a 2x2, using single bases as units. 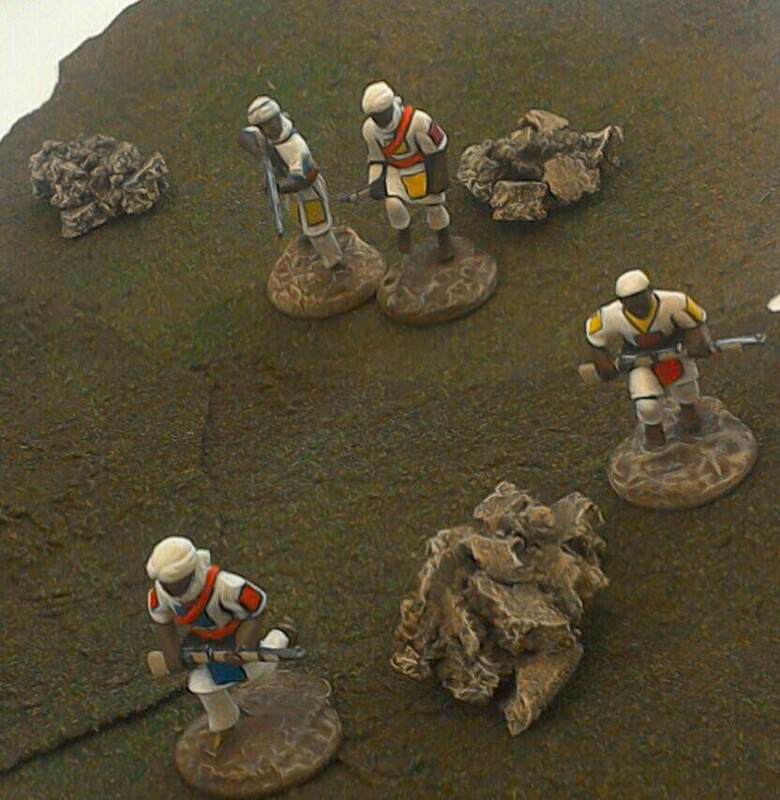 I have also played an ECW variant of Twilight of the SunKing on a table that size, but using 2mm size figures. Not done it, but I think Pikeman's Lament would work using cms instead of inches and 10mm figures and if WW2 appeals, some of the Chain of Command and Battlegroup scenarios are sert ip for 20mm figures on a 4 x4, using inches, so could scale down to 2x2 with 10mm figures using cms. For the Portable Wargame if you don't like the look of squares or lines you can always mark only the centre of every four squares and do it with some sort of rock pile, bush or other piece of scatter scenery. Basically when the miniatures move from one "square" to the next they'll just change which corner of their location has a rock pile in it. In the example above, the back group of 2 mahdists would need to move twice (sideways once and then forwards) to catch up to the next mahdist. Or instead, if the front mahdist moves straight back he will then be adjacent to both the individual mahdist and the group of two. Hope that makes sense. Seconding DBA and DBA variants, the 5core style rules are also good. I think Force on Force recommends usage of 2x2 table? Every ruleset is playable on every table size. You only have to change the measurement and sometimes the scale. "Only?!" But that's the point. When you're done with the adjustments, you still have to have bases big enough to handle and distinctions clear enough to see. Which is why Every ruleset is NOT playable on every table size. There are games which play perfectly well with 30mm castings on a 5'x9' table but which are a little awkward with 2mm castings on a 6" square. I once watched a man with a 5mm Empire table trying to maneuver 1/2" x 3/8" stands. "Playable" is not the word I'd use. I've done 54mm on a 2x2 table all the time. There's nothing holy or sacrosanct about given figure ratios. A single 54mm mahdist can represent as many combatants as I want and something like The Portable Wargame makes doing an interest Sudan gamein a tiny area very possible. I actually think it's a better idea for small games to use larger figures rather than smaller ones. Sengoku from Alternative Armies does 15mm Japanese fantasy monster hunting in that size. Tusk from Irregular does mammoth and dinosaur hunting in a number of periods on a 2x2 table. Two Hour Wargames offer a huge number of rules that will play in 2x2. Mighty Armies, available in both fantasy and ancients flavours from Rebel Minis plays in 2x2. Pretty well anything which uses elements and a grid can be scaled down. So Square Bashing, To the Last Gaiter Button, PBI, any of the Command and Colours variants, Portable Wargame. If you don't like Grids, then any DBA clone, 5Core, 1 Hour Wargames etc. If you're going 10mm, then any rules that recommend 4'x4' for 28's will work fine on 2'x2'. Use 1cm instead of 1" for distances and the slight extra movement rates and shooting distance won't hurt. Donnybrook and 7TV jump to mind. FLGS had 2" thick 2' square blue board tiles for the DBA series games. We also used them for company sized games of 15mm CD. We could run off 2 or 3 games in an evening, and get a real feel for how different weapons worked against each other. We dropped it to 6mm and substituted centimeters for inches. You could run a battalion, but there were complaints of deteriorating visual acuity (see Robert Piepenbrink above). You are goiung to be a bit strapped at 2 ft by 2 ft. However (shamless plug) Oure rules maneouver Group would work for infantry, tanks are going to struggle because of the very short ranges (max circa 600m). That being said from experience of playing at 10mm we have come to the conclusion a a good game needs 10 to 15 houses of the like. That fits easily on an area about 400mm by 400mm, well inside you limits. You do need however to make sure you have some way of stopping houses "drifing" as you play else the town changes shape as you play. The picture is not ideal but the village top left is what I am talking about. As has been said the alternative is to go for 1mm= 2m to give a bit of extra space. However stuff starts to look a bit cramped, road become 50m wide which can result in daft seeming situations, few roads are that wide and you would need to compensate to make it a more plausible game. At 1mm=50m its going to look daft at 1 to 1 and otherwise it looks like a boargame with minatures, but it depends how you see your gaming experience. I would agree with DBA and possibly you could tweak DBM to work at a smaller scale as personaly I think it is a more tacticaly flexible game.